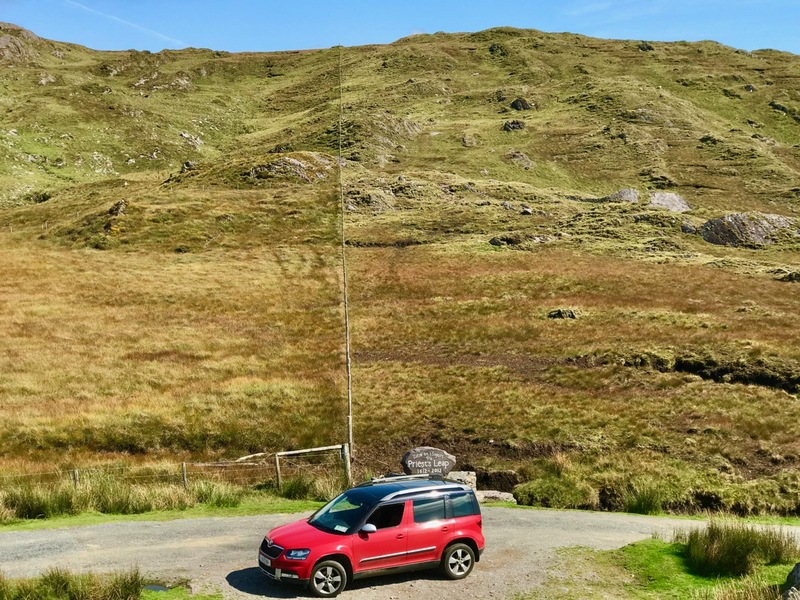 Last week Finola reported on a journey over the mountains on the ‘Priest’s Leap’ road from Kenmare, Co Kerry to Bantry, in West Cork. 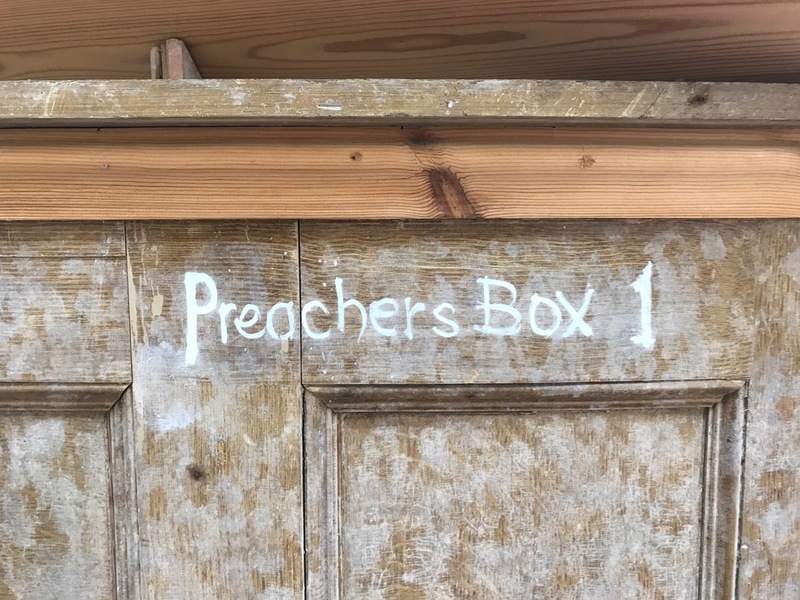 We received a fusilade of comments from readers who told us we hadn’t seen half of what there is to be found on this road so, on the very first day of September, we were off again, this time getting a different perspective by travelling the other way. 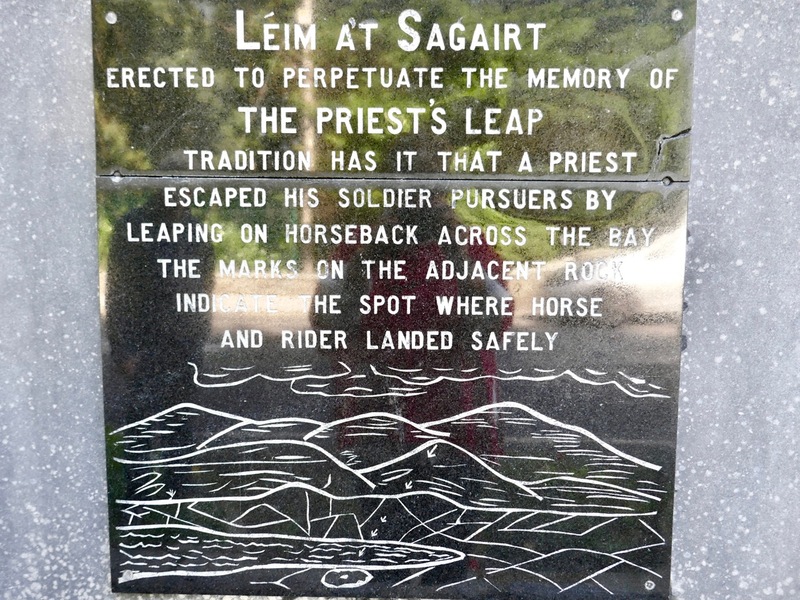 Before we left Bantry we had to find the very spot where the priest – being pursued by soldiers – landed after he and his horse leapt off the highest summit of the road which has been named after him. 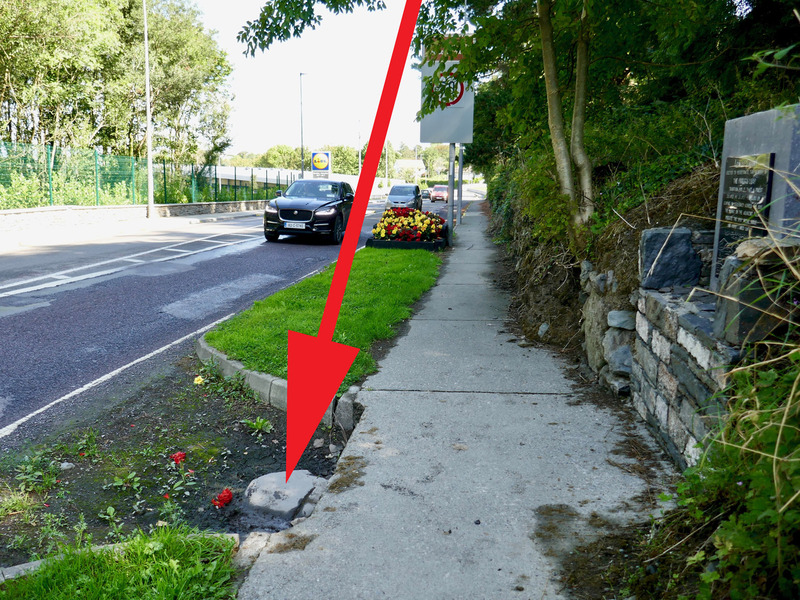 It’s great that this stone has been left untouched by the modern roadmakers, so that all can see the hoof marks to this day. I calculated that, 400 years ago, the priest was airborne for a distance of some 12 kilometres as the crow (or horse!) flies – considerably more than some of those early aviators of the 20th century were credited with! 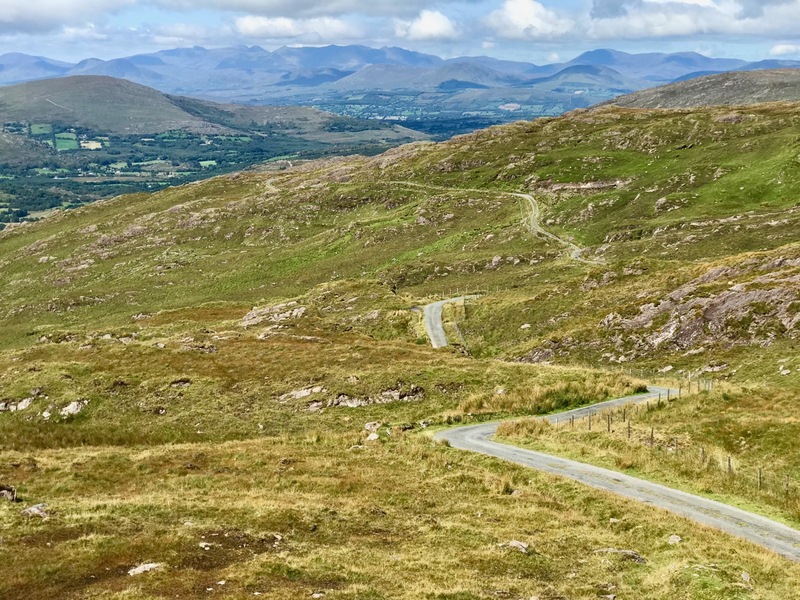 If you are not of a nervous disposition, and don’t mind travelling a narrow, single-track mountain road for some 15 kilometres, probably sharing it only with a few sheep, then to pass over this route is one of Ireland’s most spectacular experiences. Choose your day, though: we were lucky to have hot sun and clear views the whole way. 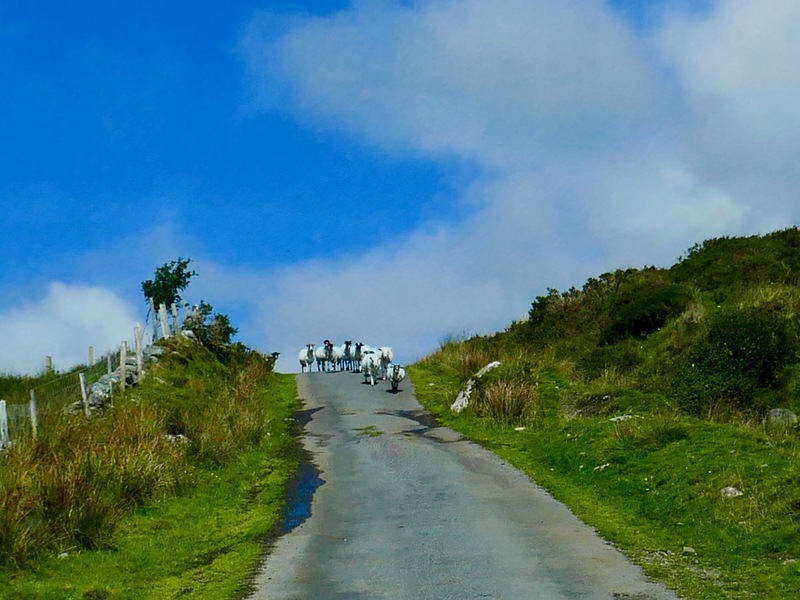 If you survive it to the top, you are right on the Cork – Kerry border: in the photo below, the fence going on up the hill is exactly on that border line (and the point at which the priest and his horse took off is to the right of it at the peak). Stop and look around: the views in every direction are stunning. 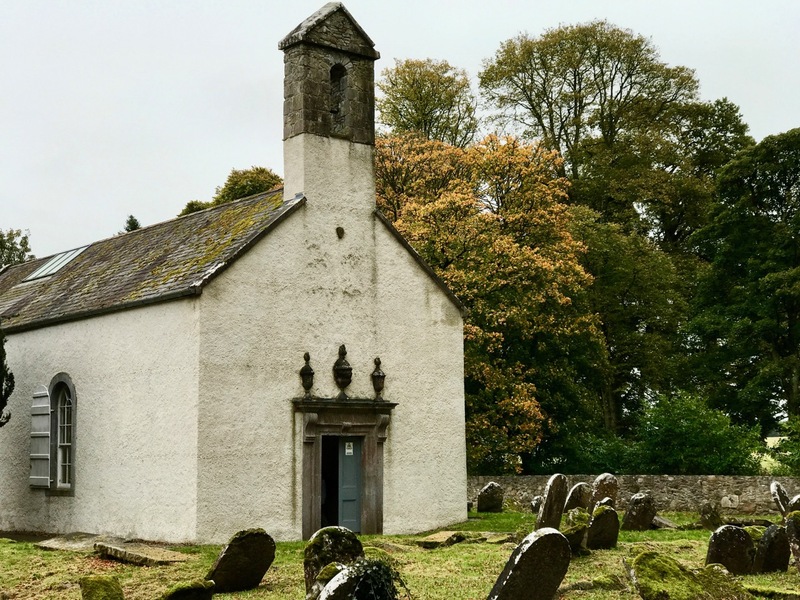 After we crossed the border into Kerry we came downhill and stopped again at the remote, picturesque Feaghna burial ground in the townland of Garranes. 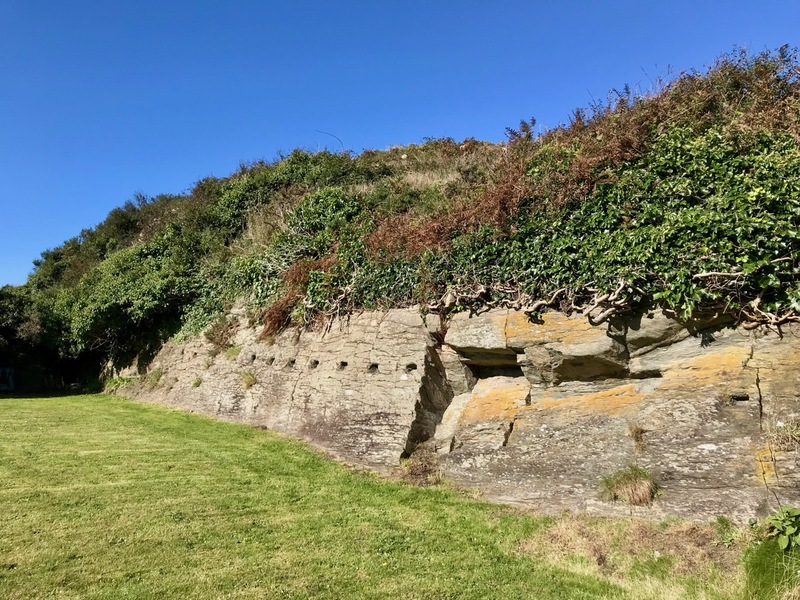 On our last visit we were completely unaware of the existence of an unusual archaeological site nearby – one which has a number of traditions associated with it.
. . . 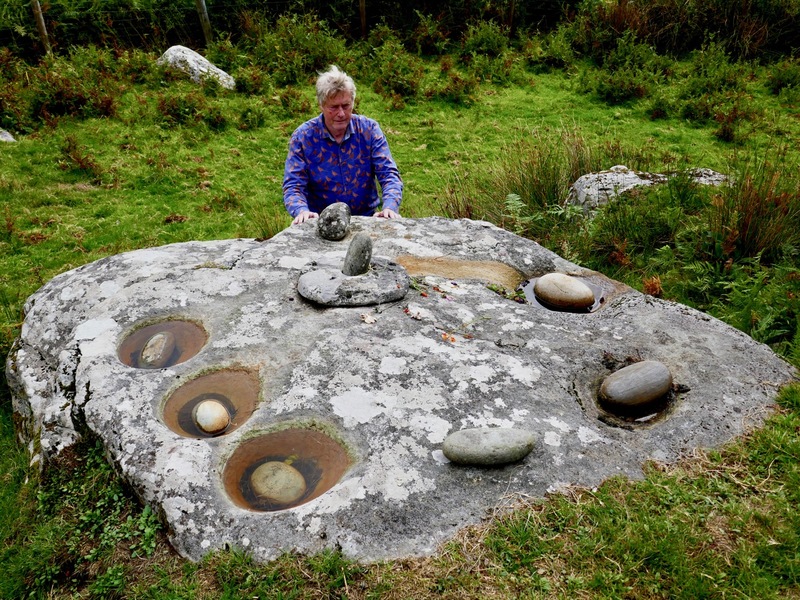 The term ‘bullaun’ (from the Irish word ‘bullán’, which means a round hollow in a stone, or a bowl) is applied to boulders of stone or bedrock with hemispherical hollows or basin-like depressions, which may have functioned as mortars. 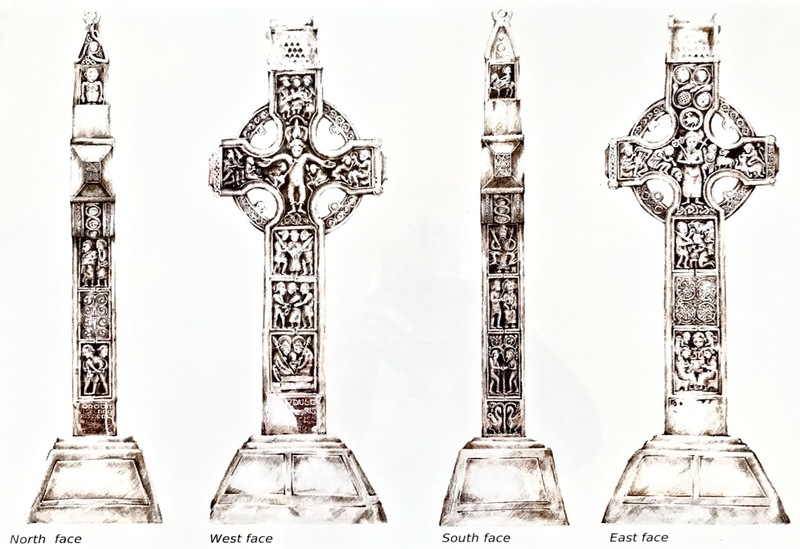 They are frequently associated with ecclesiastical sites and holy wells and so may have been used for religious purposes. 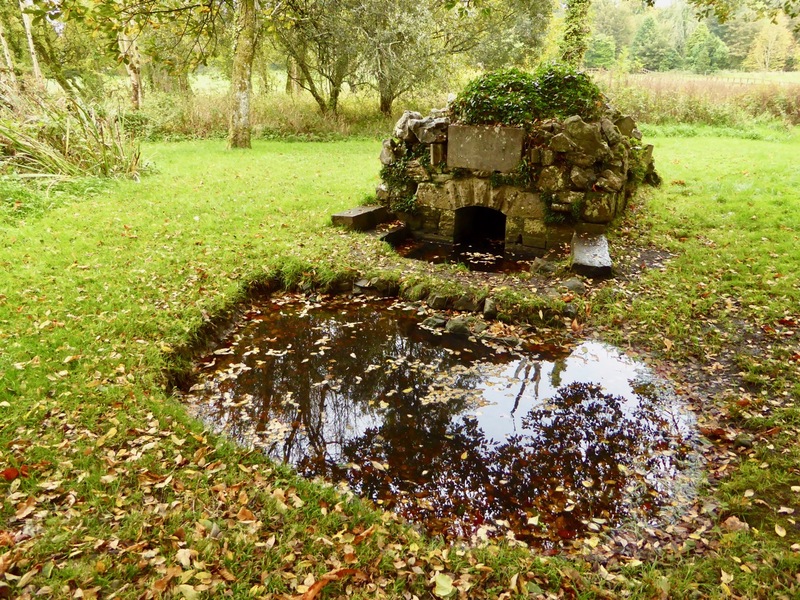 Other examples which do not appear to have ecclesiastical associations can be found in bedrock or outcrop in upland contexts, often under blanket bog, and are known as bedrock mortars. They date from the prehistoric period to the early medieval period . 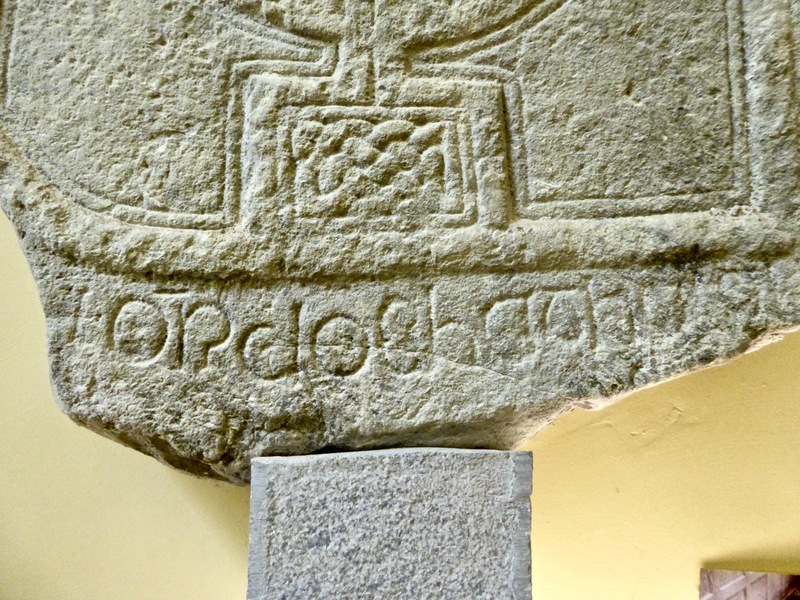 . .
A drawing by the 19th century antiquarian W F Wakeman of a Bullaun Stone at Killinagh in Co Cavan. 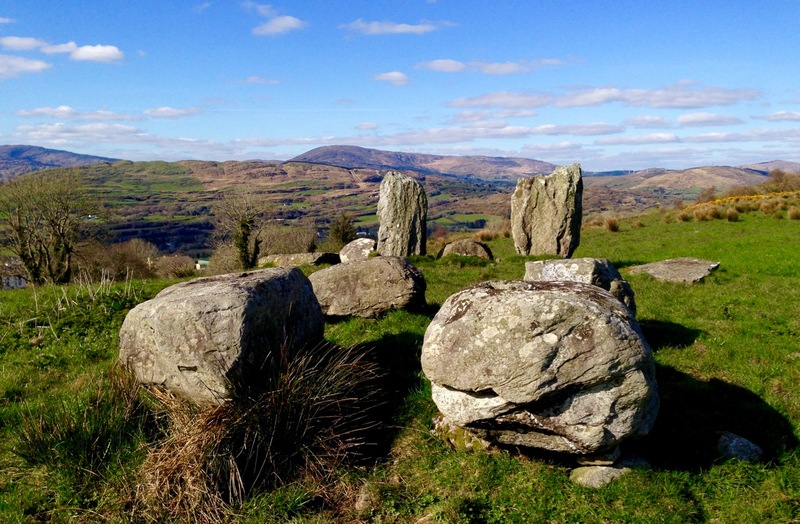 Here, the stones are known as ‘cursing stones’ – a term also applied by some commentators to the Feaghna site at Garranes. 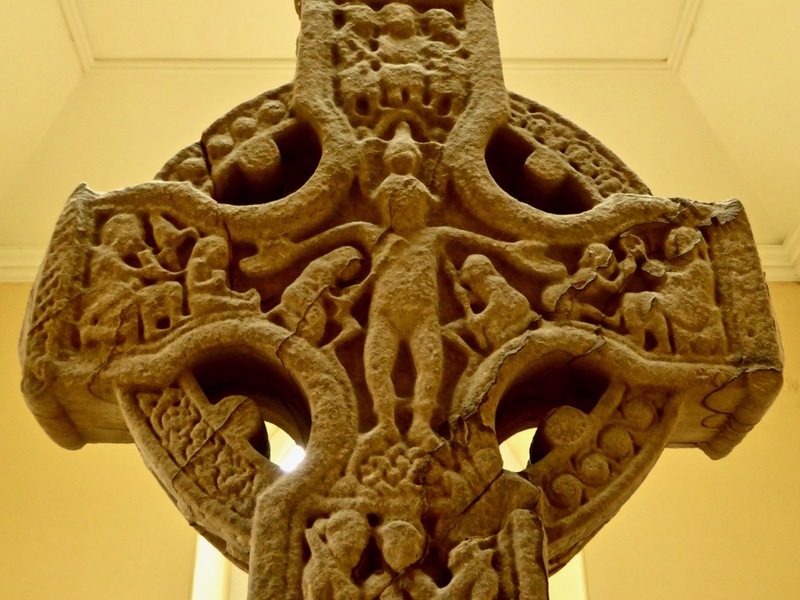 Interestingly, the Cavan site is also referred to as ‘St Brigid’s Stones’, while the Rolls of Butter are associated with the local saint, Fiachna. 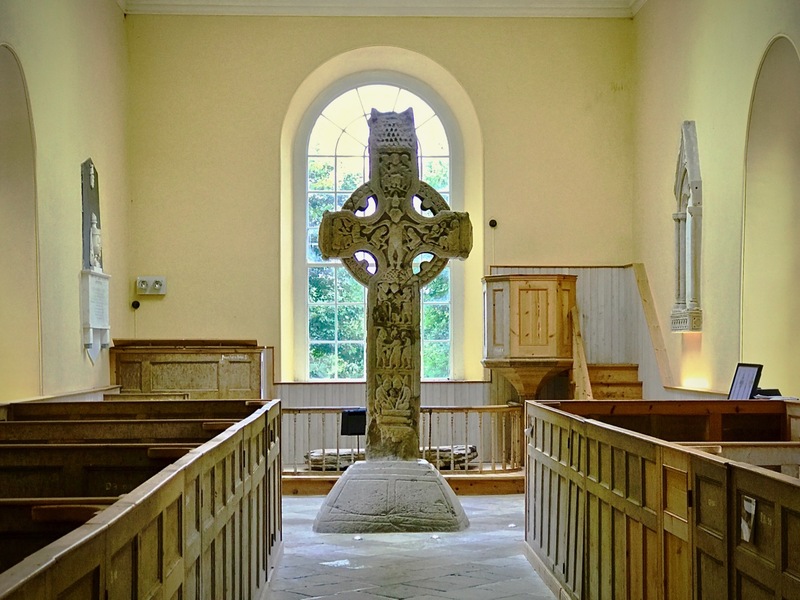 Beliefs – stories – are, of course, as fascinating as any archaeological evidence, and have to be investigated. 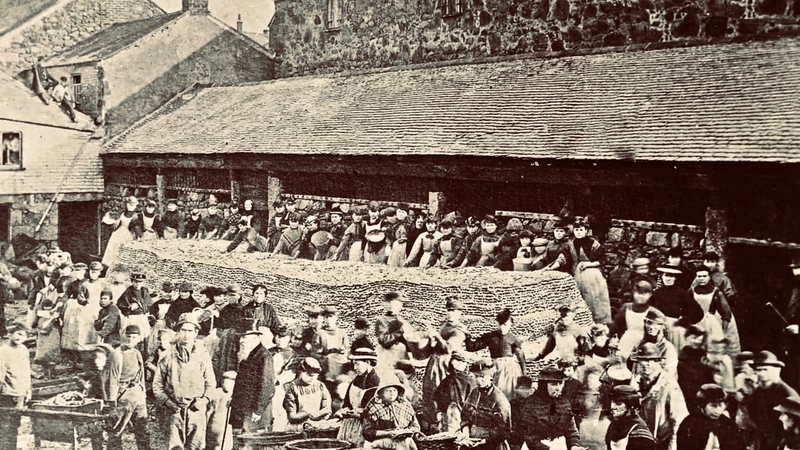 Here, they abound – and are best learned from local sources: in this link folklorist Matt Sullivan has put together an entertaining selection of local opinion about the Rolls of Butter. 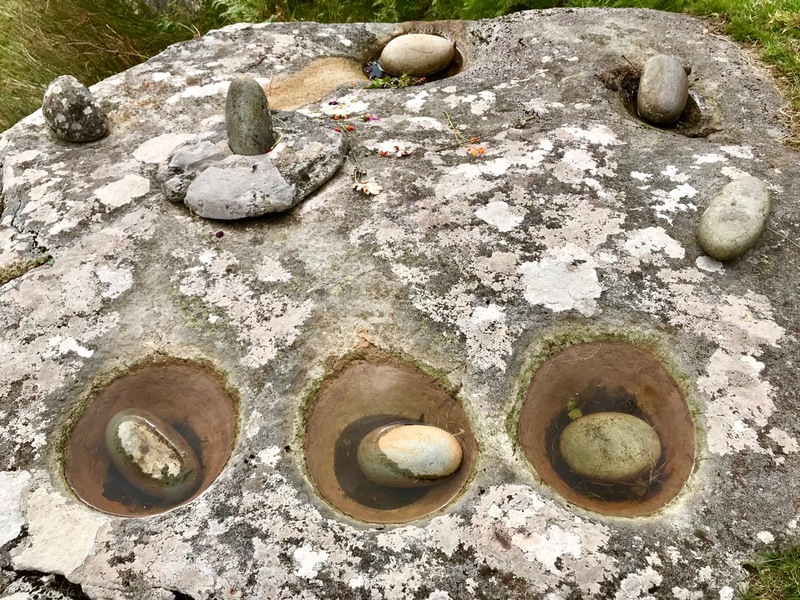 A few years ago I wrote a post covering some bullauns, ‘cursing stones’ and ‘curing stones’ – but at that time I wasn’t aware of these examples just a mere priest’s leap away from our own home.
. . . A structure, usually discernible as a low, stone foundation or earthen bank enclosing a circular, oval or subrectangular area, generally less then 5m in maximum dimension. 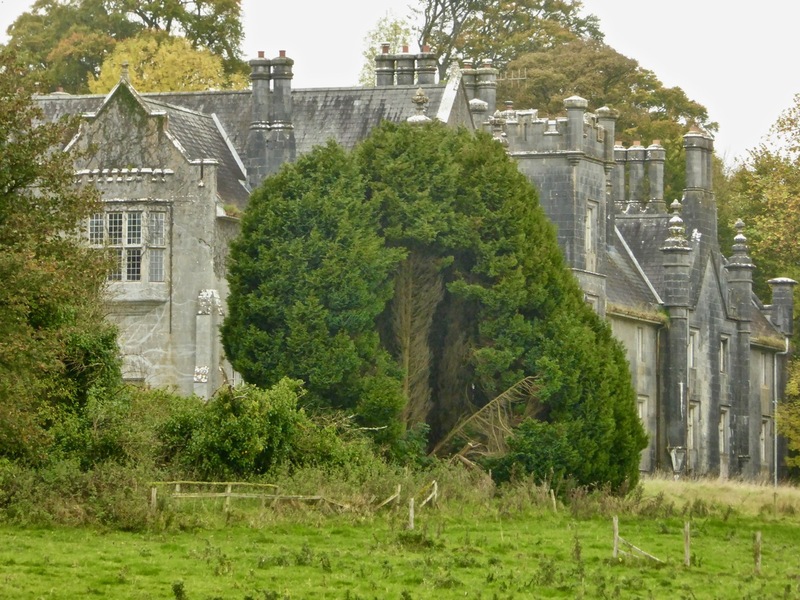 The remains are generally too insubstantial to classify as a house but the majority probably functioned as dwellings. These may date to any period from prehistory (c. 8000 BC – AD 400) to the medieval period (5th-16th centuries AD) . 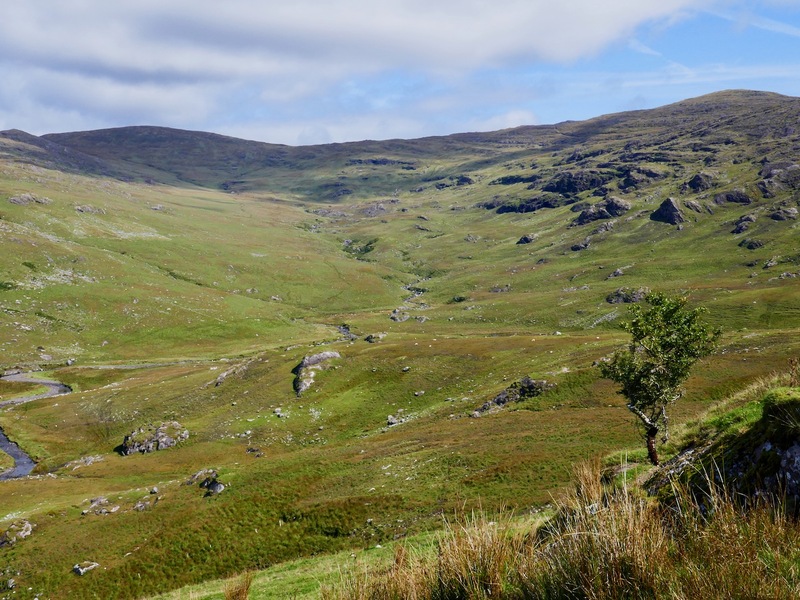 . .
It’s intriguing to think that these beautiful natural landscapes which appear so lonely to us were occupied hundreds – perhaps thousands – of years ago. It’s likely that they have changed very little over all that time: history is clearly set out for us as we travel over this ancient way. The days are shortening, and we still didn’t have time to explore everything the Priest’s Leap road has to reveal. We’ll be back again before too long – in search of more stories. How fortunate are we? 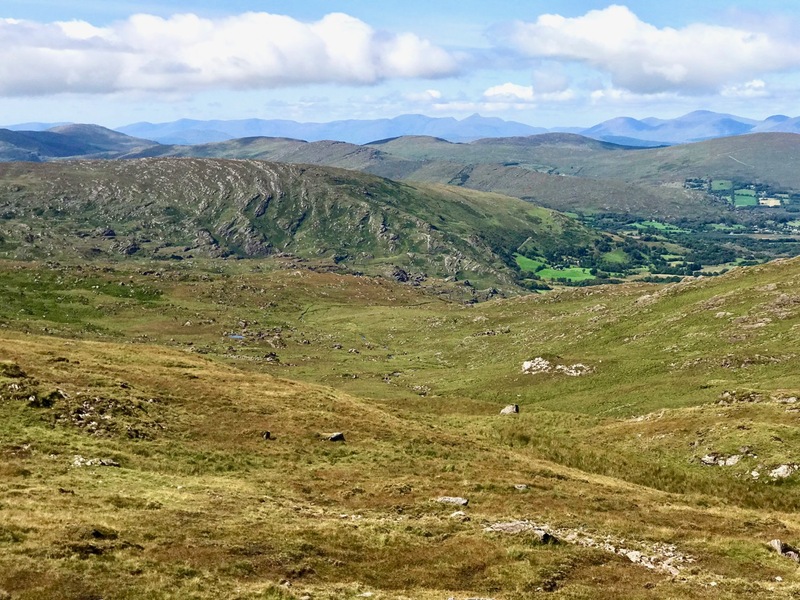 We are free to spend our days wandering the world’s most beautiful landscapes, here in Ireland: landscapes which have changed relatively little over the last five thousand years. They have changed, of course, but the human hand has had less impact in this country than in many other developed nations, especially in these wilder parts. That is why we relish our explorations: we are walking the past. Every expedition requires a little pre-planning. 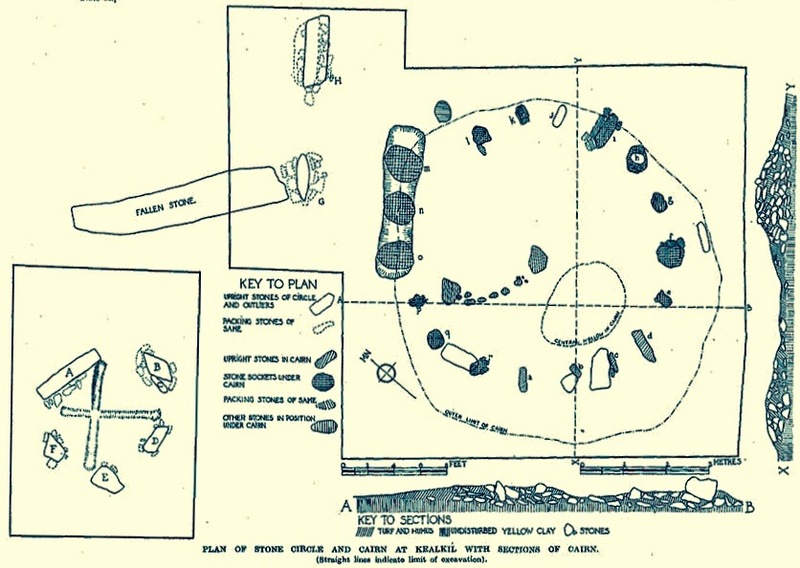 This week we were keen to catch up with a group of monuments known as ‘boulder burials’. Finola tells me that, when she was first studying archaeology, they were known as ‘boulder dolmens’: I prefer that term – perhaps because it has a touch of the antiquarian about it – and, in any case, the use of the word burials implies a definitive function which has not been universally borne out with the examples that have been excavated. But I will leave Finola to delve into the specifics of that subject in her post Boulder Burials: a Misnamed Monument? 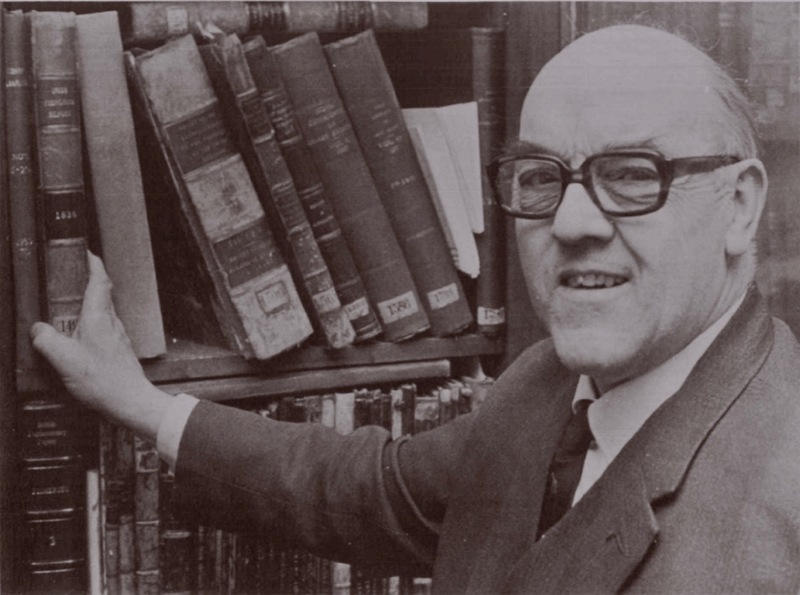 First, we look to the available information: William O’Brien’s Iverni – A Prehistory of Cork (The Collins Press 2012) is an essential primer on the pre-Christian era in this corner of Ireland since the first human foot was set on its shores. 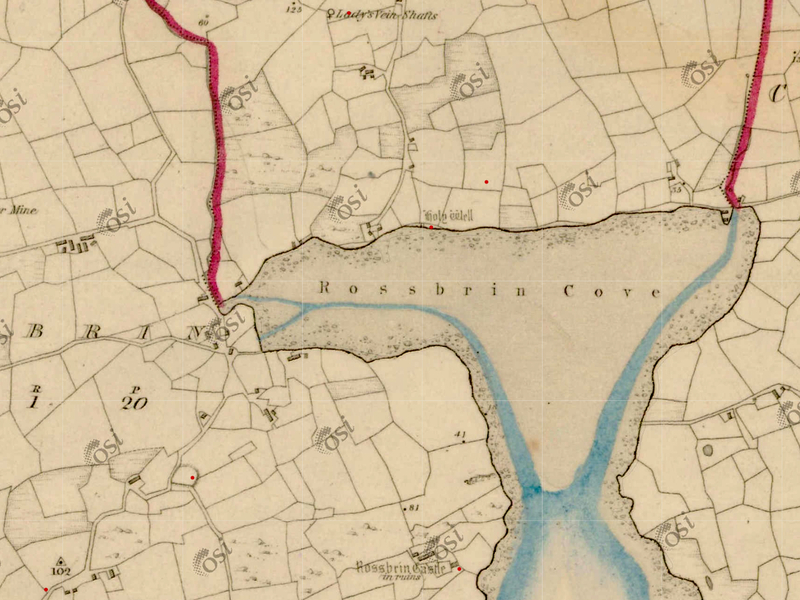 Then there are maps to be consulted: the Ordnance Survey Office was created in 1824 to carry out a survey of the whole island for land taxation purposes. 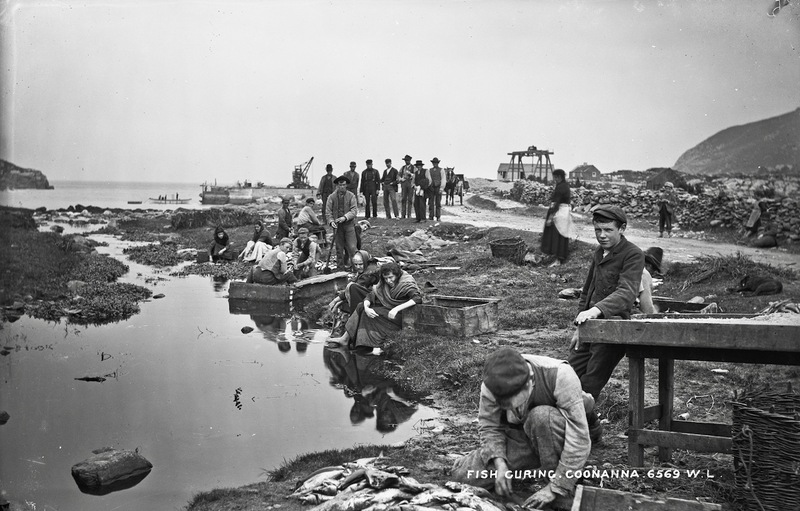 The original survey at a scale of 6 inches to 1 mile was completed in 1846 and Ireland thus became the first country in the world to be entirely mapped at such a detailed scale. 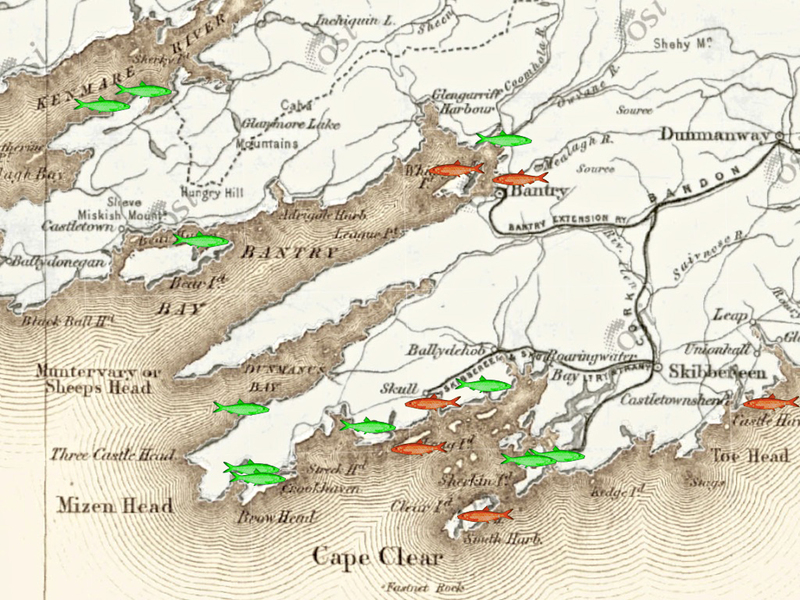 From the outset, known historic sites and monuments were recorded and the present Discovery Series at 1:50,000 scale provides a wealth of information to the fingertips of historians and adventurers. 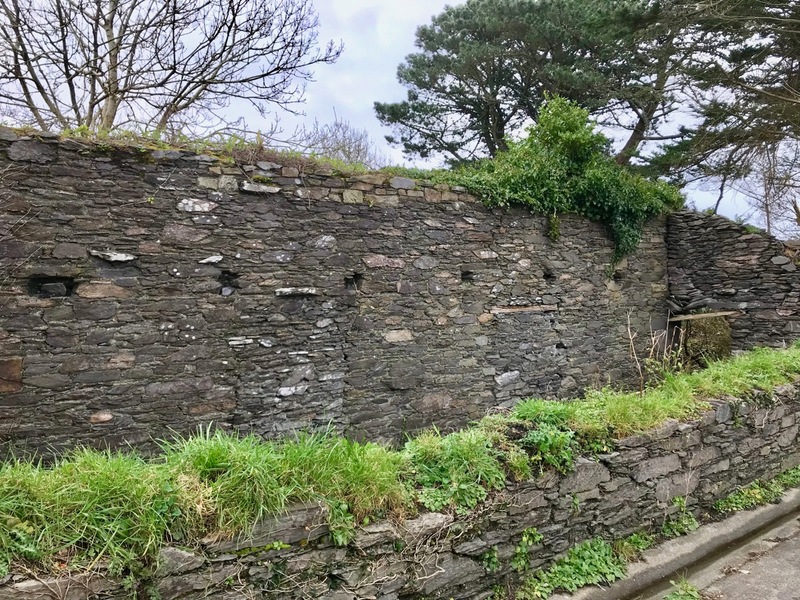 Before setting out we usually consult with the Archaeological Survey Database of the National Monuments Service: this gives us the fine detail on where to find recorded historic sites. Yet in the end the most valuable information often comes from knocking on doors. 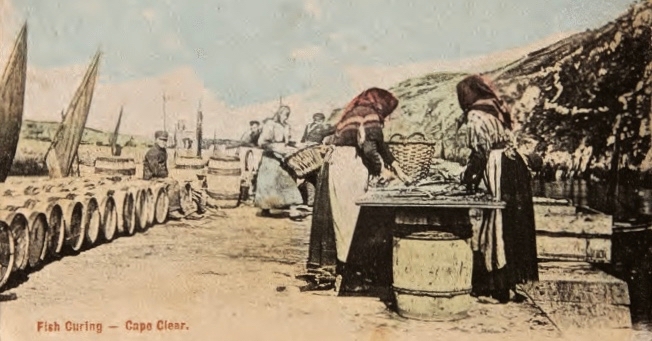 Farming families here often go back through many generations and local knowledge is always passed down through them. It’s here that you sometimes pick up the ‘stories’ that are associated with ancient sites – for me, these are just as interesting as any formal records. 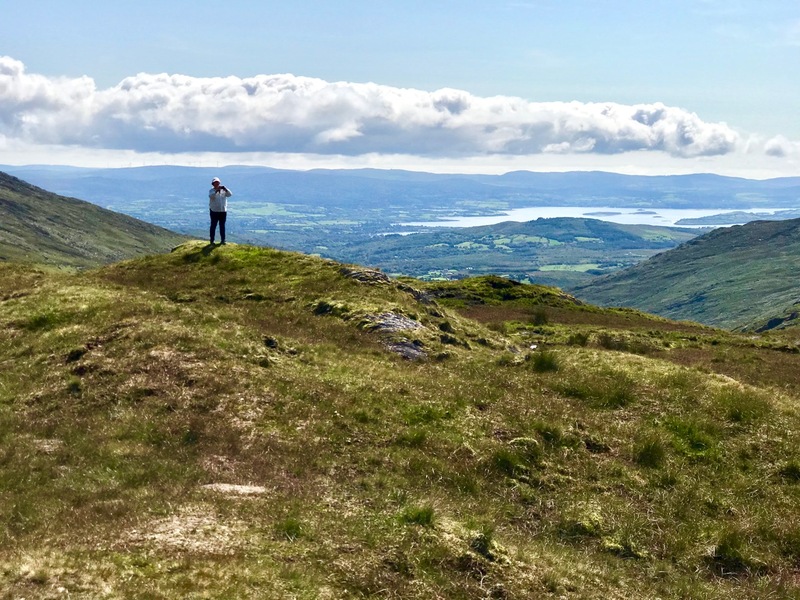 This week our travels brought us to the Breeny More and Kealkill complexes, high up in the hills above Bantry, heading towards the wonderfully named Cnoic na Seithe – the Mountains of the Spirits. 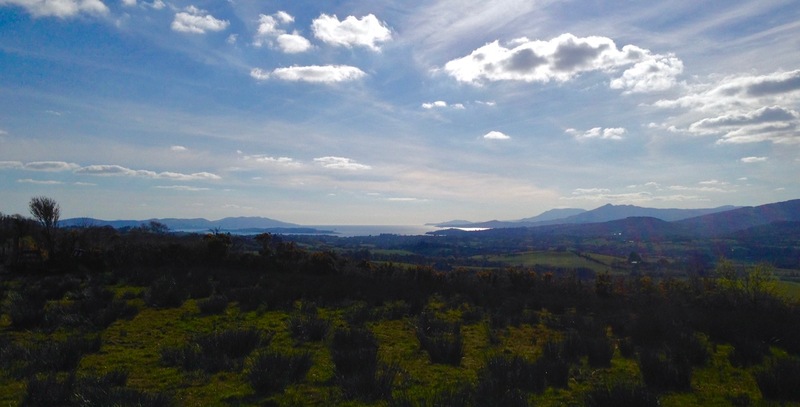 This was on a perfect spring day: the views all the way down the bay with the Beara on one side and the Sheep’s Head on the other can only be described as spectacular. 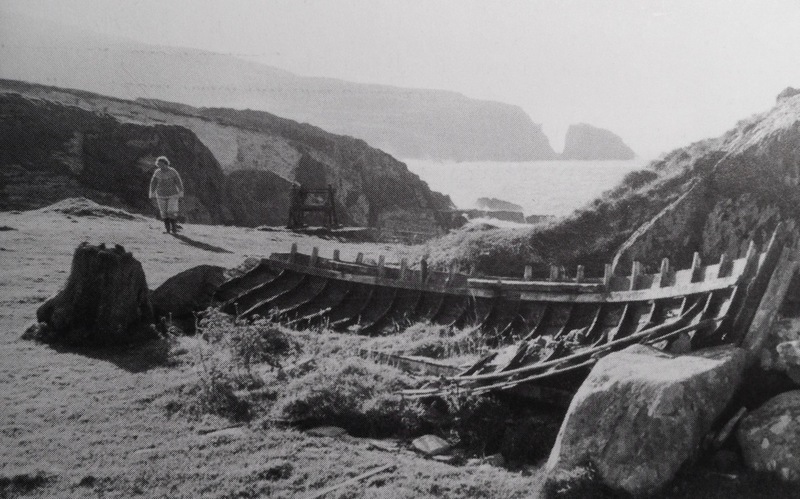 So, it’s Finn McCool and the Tuatha de Danaan that we have to look to, perhaps, for explanations as to why we find these incursions on our natural landscape standing as solidly and unchangingly as they did a few millennia ago. Perhaps not quite unchangingly, in fact: archaeologists have had a hand in the present day appearance of some of them. 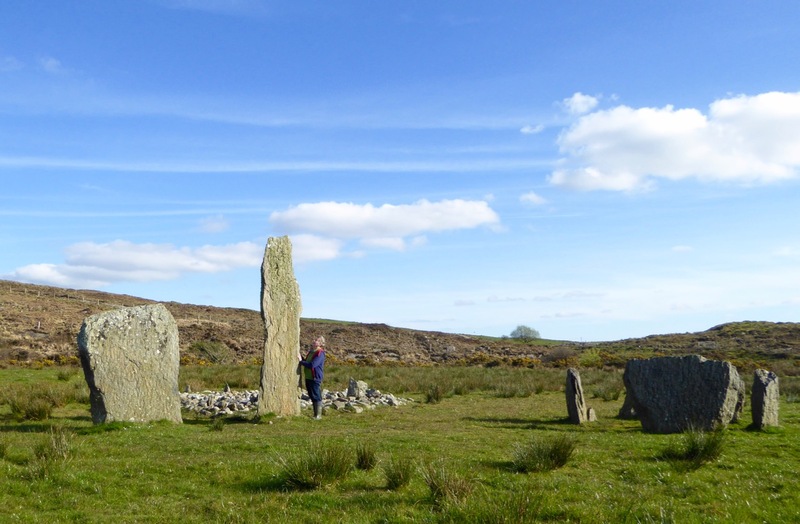 In the photo above you can see me wondering at the 4.6 metre high megalith which is part of the Kealkill complex. 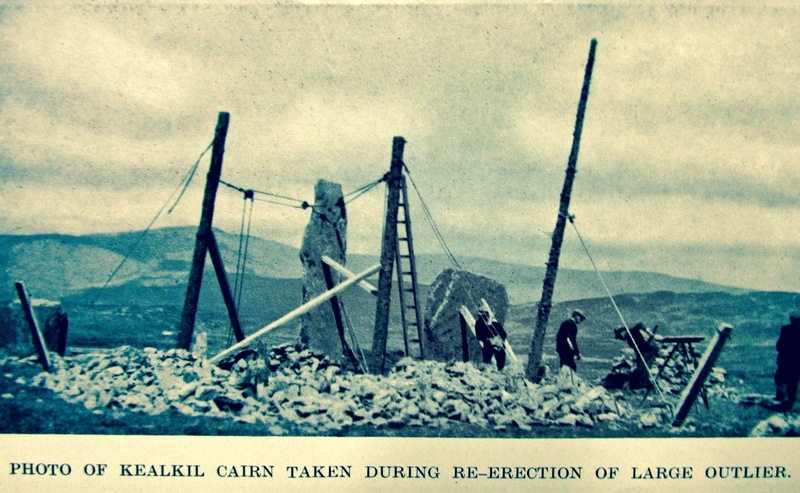 When the site was explored by Sean P O’Ríordáin in 1938 that stone had broken off and had fallen: O’Ríordáin re-erected the remaining part of the menhir. 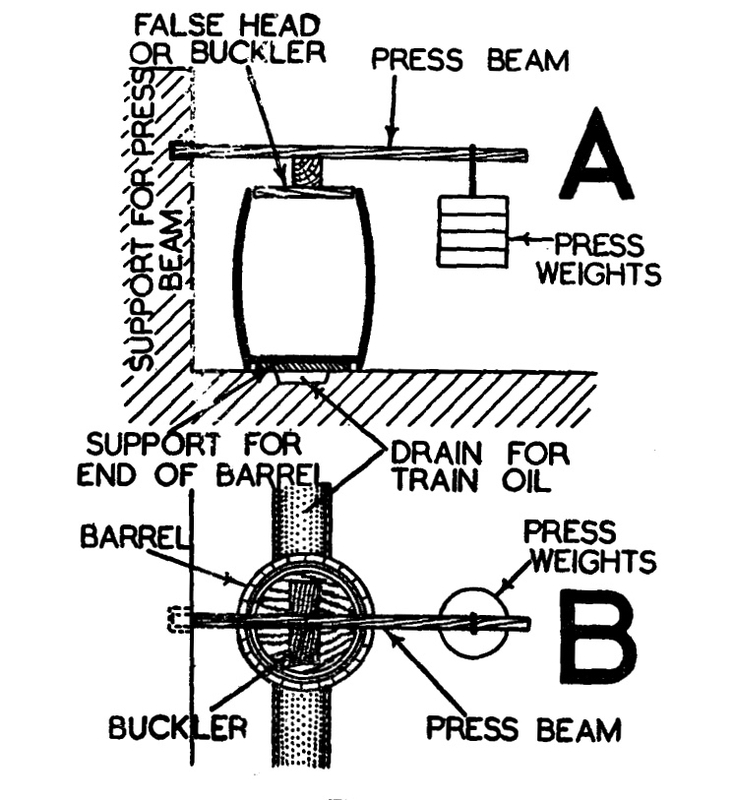 The original would have been at least a metre higher than what we see today. The Breeny More site and the Kealkill complex are near neighbours. 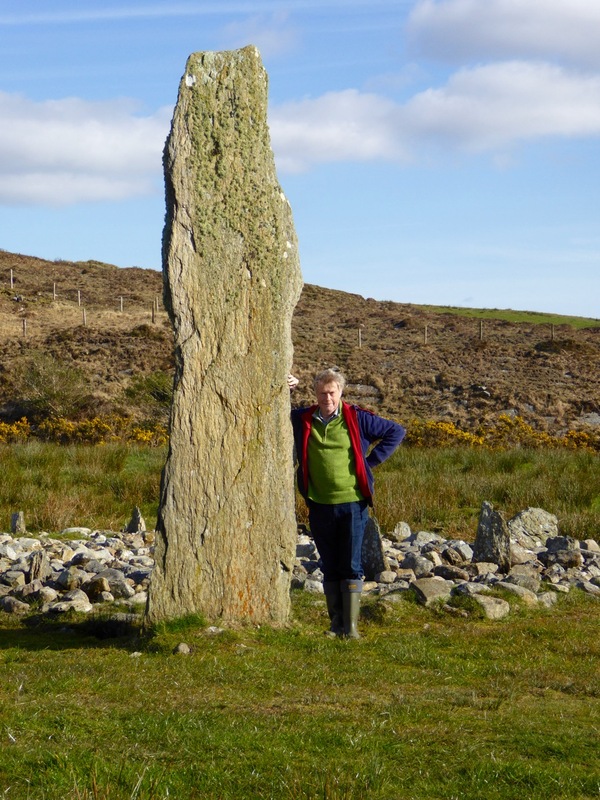 Both contain various artefacts: standing stones, stone circles and boulder burials. 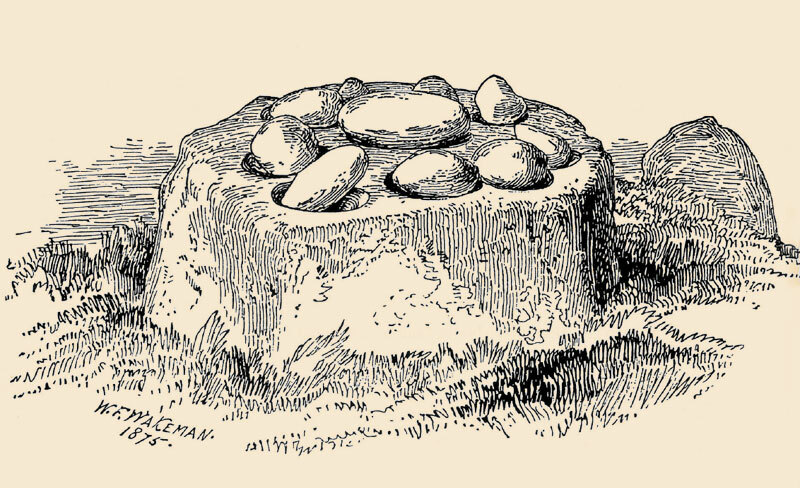 Kealkill also has a radial cairn. Both are set against a background of moorland, mountain and bay. Kealkill is easily accessible although boggy. Our second archaeological adventure this week was also boulder burial orientated. 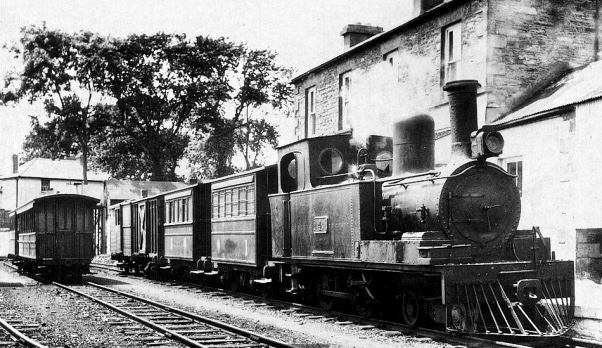 This was close to home in the townlands of Rathruane, Lisheen Lower and Bawngare. Again, Finola has detailed the findings in her post, but I was struck at each of these sites that the their settings, too, were on high ground with excellent distant views. In each case, mountains were prominent. I couldn’t help thinking that the boulders could have been placed where they are specifically because of the visibility to the various peaks. Might it even be that territories were marked out by these huge stones? Boundaries have always been important to human strategies: we have been identifying and ‘naming’ the land before records began to be written. 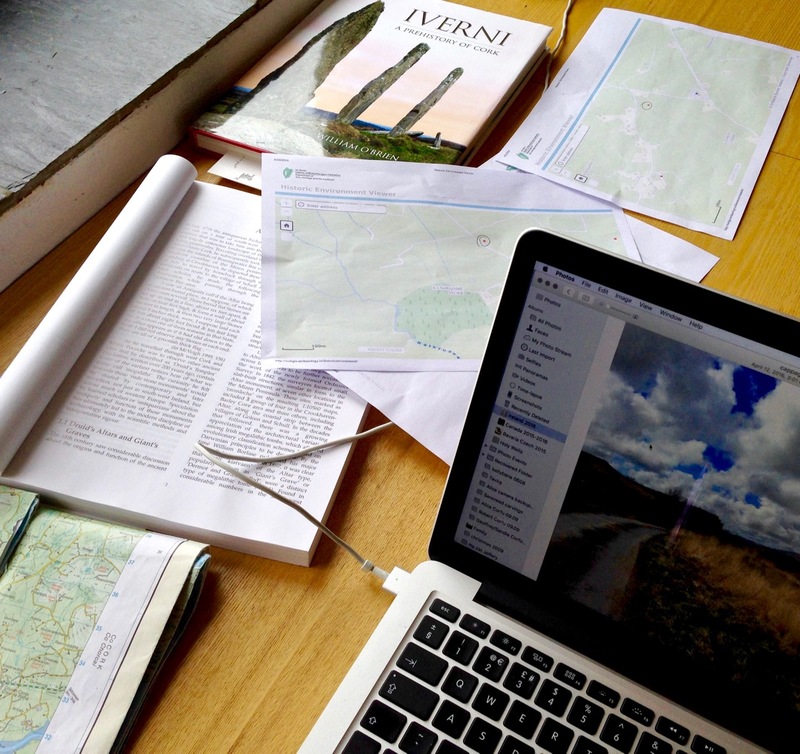 Field names, townland names, parishes, baronies… A whole lot more to be researched, visited and recorded. 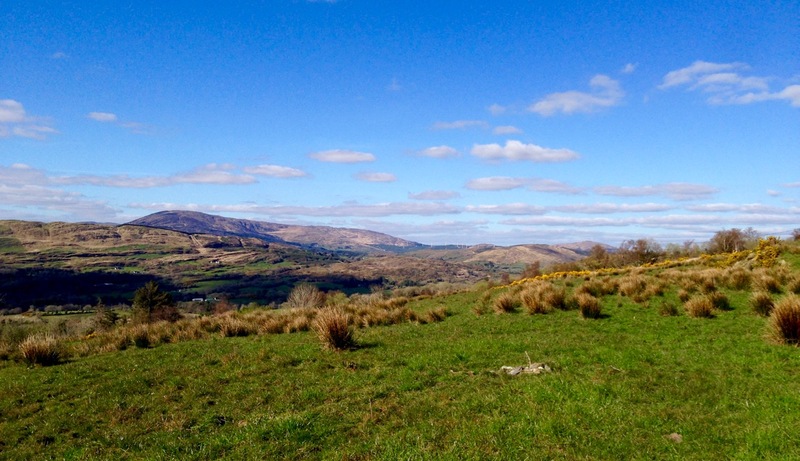 Our long walk through Ireland’s past has barely begun! Both Robert and I have written about prehistoric rock art several times in this Journal – here and here, here and here. Readers will know that it was the subject of my Master’s thesis in the early 70s, and that it has become a shared passion for us both as well as a retirement project. 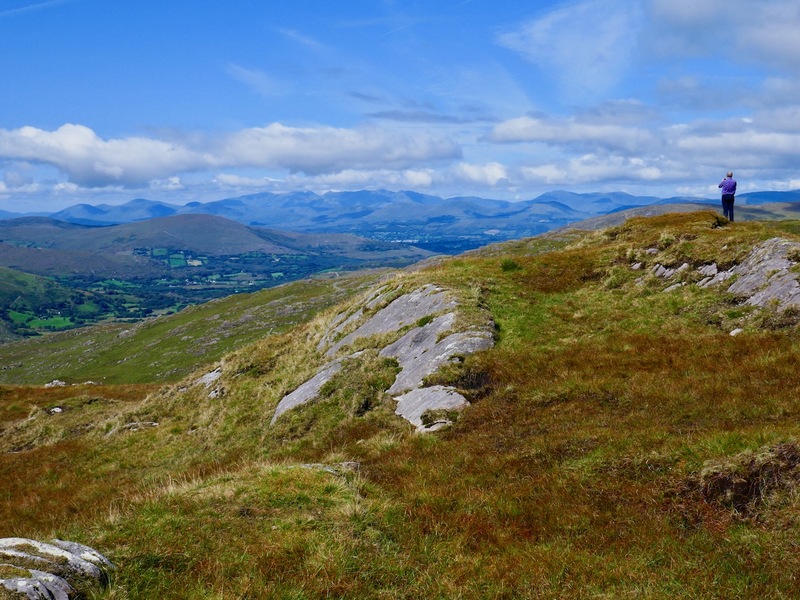 One aim of this project for me is to assess how rock art has been doing, as a category of ancient monument in Ireland, since I last studied it intensively forty years ago. Within the archaeological community there is discussion about how best to protect rock art sites. 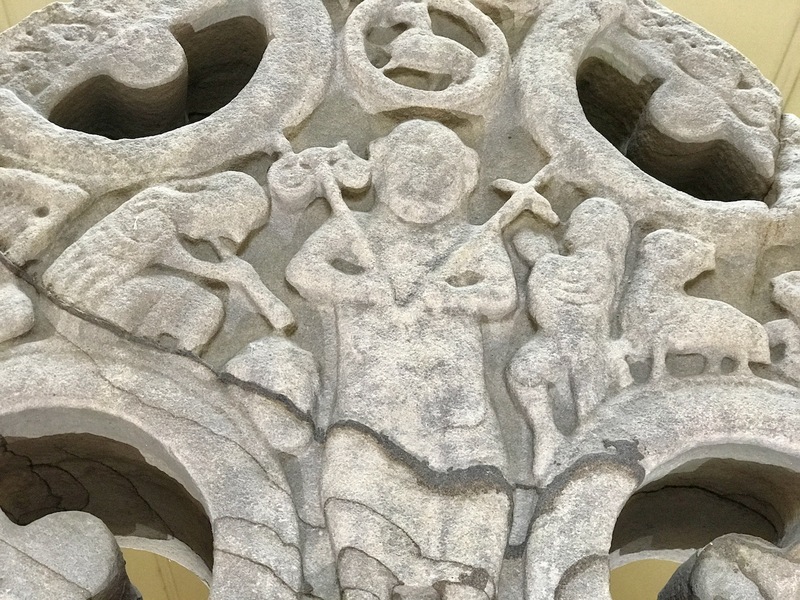 The arguments take shape around opposing approaches: the first alternative is to promote and advertise rock art, to make it as well-known as other monuments such as megalithic tombs and medieval friaries; the second is to leave it lie in obscurity. Spain has a lot of rock art, and the approach there is to encourage people to come and view it and explore it. 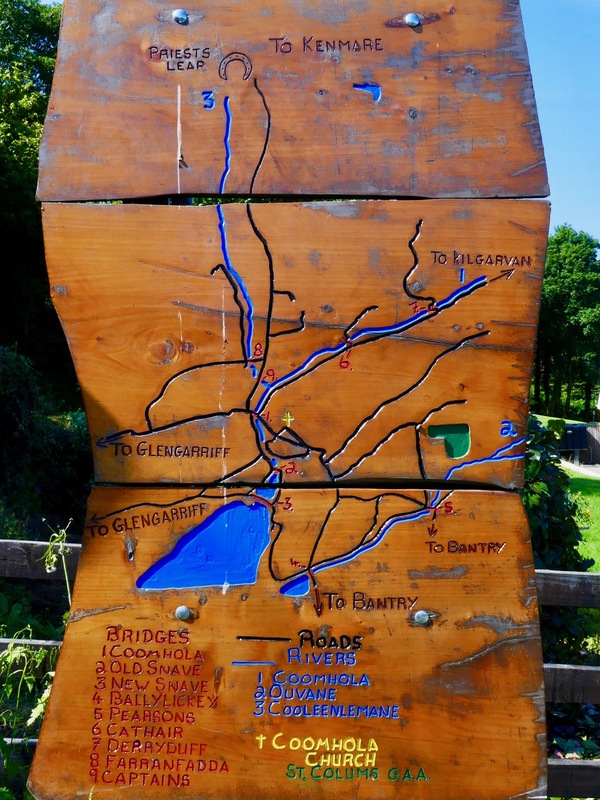 There are visitor centres, interpretive signs, rock art trails. 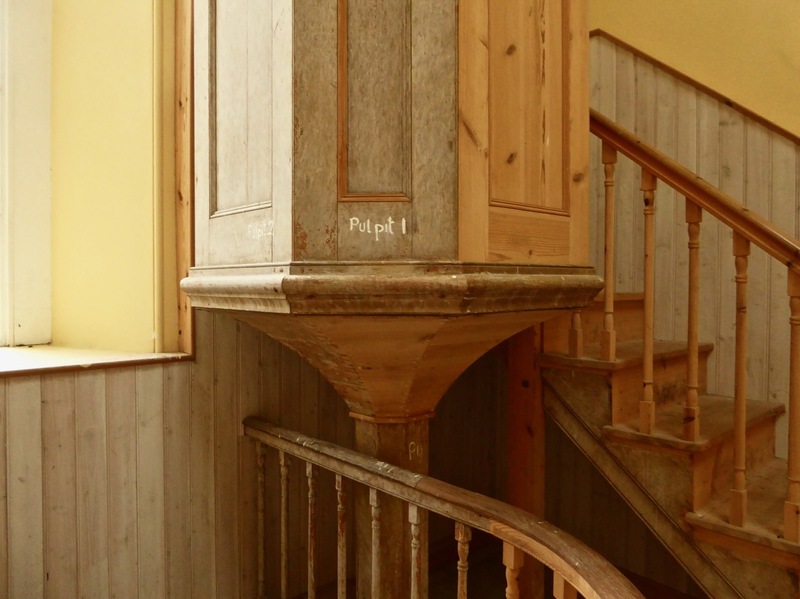 While the results have been positive on the whole, raising the profile of this class of site and increasing the understanding and respect of visitors, it has not been without challenges: some damage and vandalism has occurred on carved panels. In Ireland we have taken a low profile approach when it comes to promoting rock art. Its very obscurity, the argument goes, is its protection. All known rock art sites are recorded in the database maintained by the National Monuments Service, and anyone planning on building on or developing a piece of property must check plans against this inventory. But apart from that we do not advertise the presence of rock art with signs or centres. 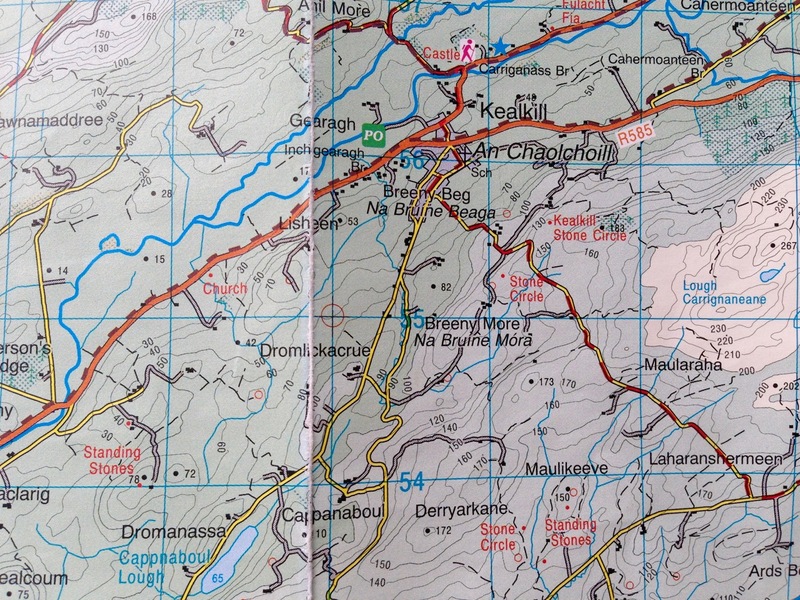 A few are marked on the Ordnance Survey maps, but are difficult to find. The folk-beliefs of country people have helped in the past – where any prehistoric site was known it was never interfered with for fear of the bad luck that would follow. 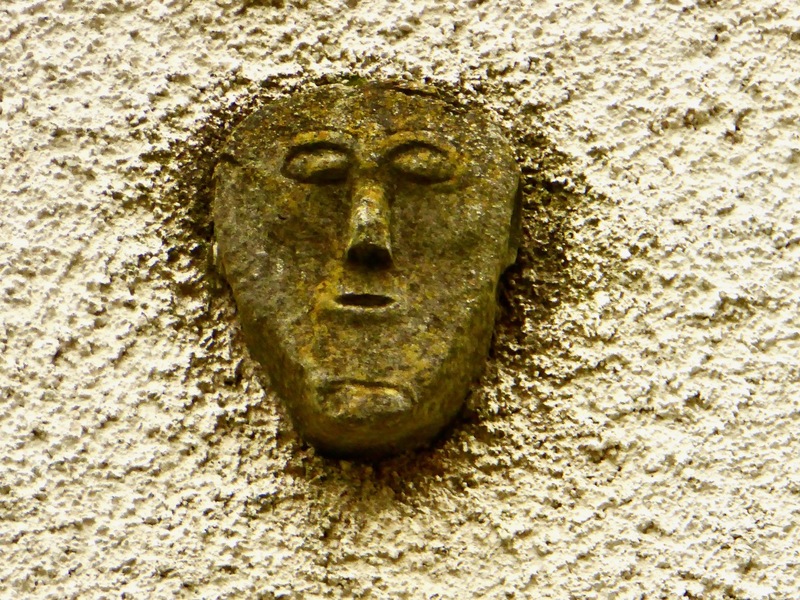 Weathering and lichen growth are not kind to carved surfaces over time and rock art in Ireland has not been protected from such natural occurences. On the whole, however, the fact that rock art is little known has indeed functioned to ensure that carved panels remain in place and my own sympathies would have lain therefore with the second argument. However, times are a-changing in Ireland and I have become alarmed at the prospects for the conservation of this important prehistoric resource. I have come to believe that the more people who know about rock art, who know the locations of the rocks and can keep an eye on them, the better. 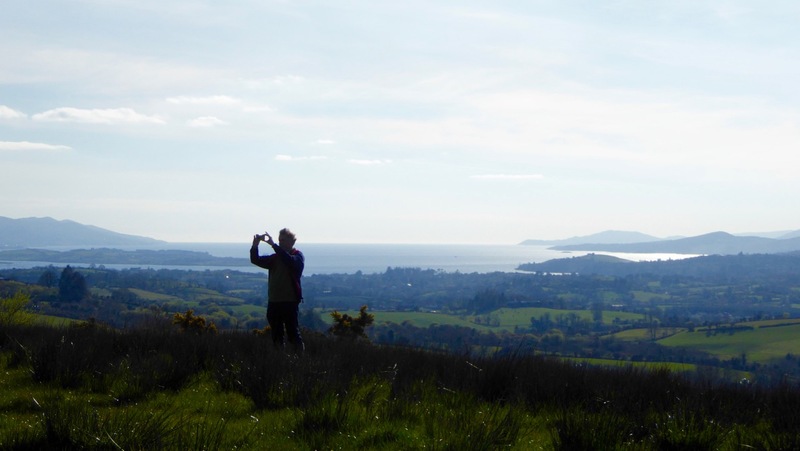 Robert and I have spent a year now, in West Cork, visiting rock art sites and re-recording them. 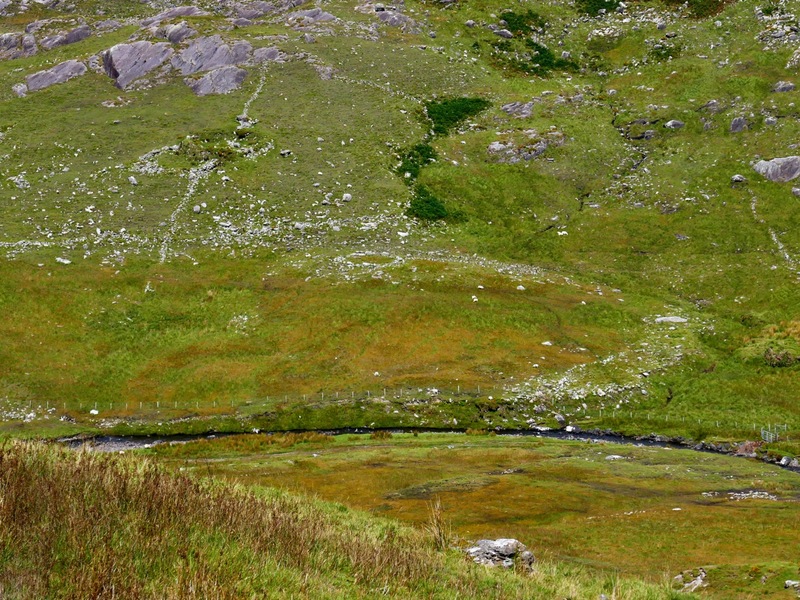 I have begun to understand in that time that there are two main dangers to rock art in the Irish landscape: ignorance and the economy. If only we’d known, we would never have built it on top of the rock art! First: lack of awareness. By this I mean that in general people simply do not know that there is a class of ancient monument known as rock art. They don’t know what it looks like and don’t recognise it when they walk over it. This is not their fault – rock art can be almost impossible to see on the surface of a weathered rock on a grey day, even when you know it’s there. We have described how in one case a building was erected on top of rock art. 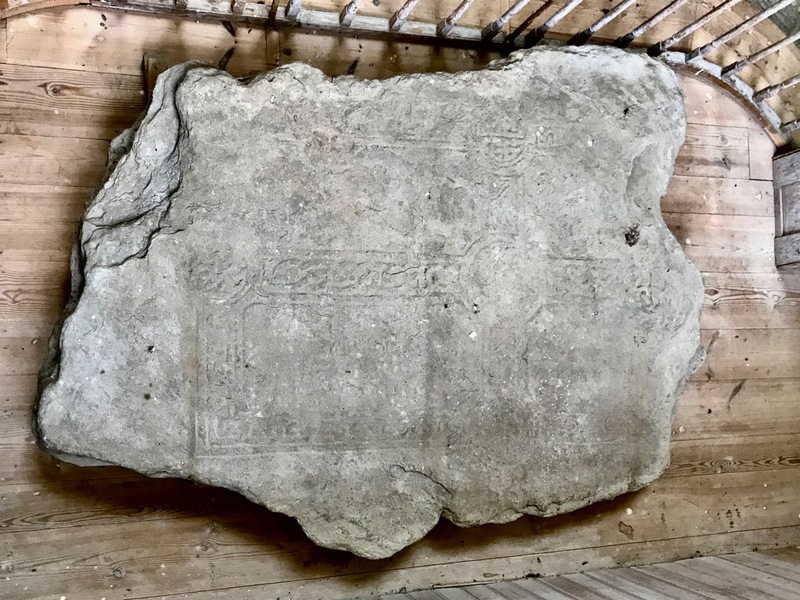 In another case we are aware of, a piece of rock art was unrecognised and probably damaged when a homeowner erected an ornamental stone circle beside it. In both cases the homeowners would have protected the rock art had they known it was there, or understood the extent of it. Second: the economy. Here, two huge threats to rock art exist. 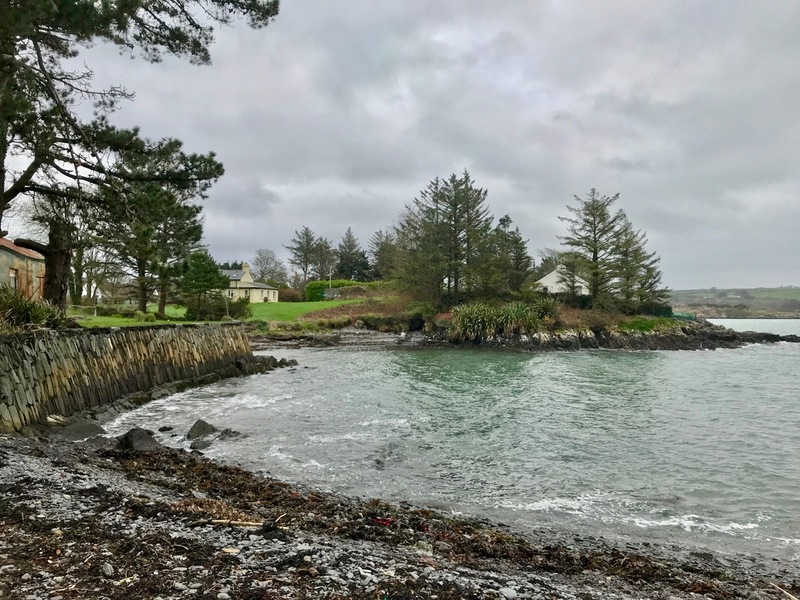 The first is in the rapid growth of forestry plantations in Ireland – a practice that is altering the landscape and obscuring what lies underneath in many areas of the country. We have experienced this first hand: rock art in a nearby townland can no longer be located in a young forestry plantation. The second is even more serious – the threat lies in the encouragement to farmers to improve and bring into production previously marginal land. 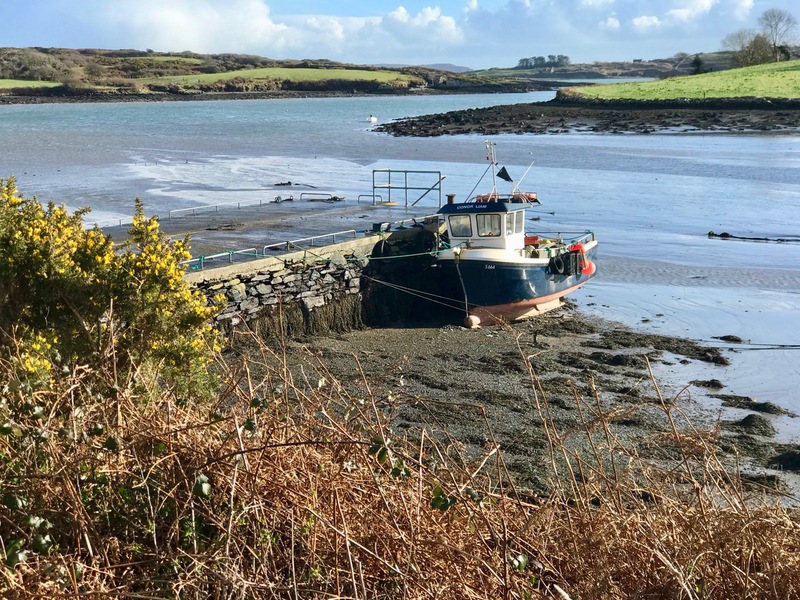 All around us in West Cork the sound of the rock breaker is as common as the lowing of cattle. Vast stretches of rocky land, suitable only for a few sheep, are being levelled, drained and seeded. Green fields are appearing where once only scrubby grass and bog could grow. 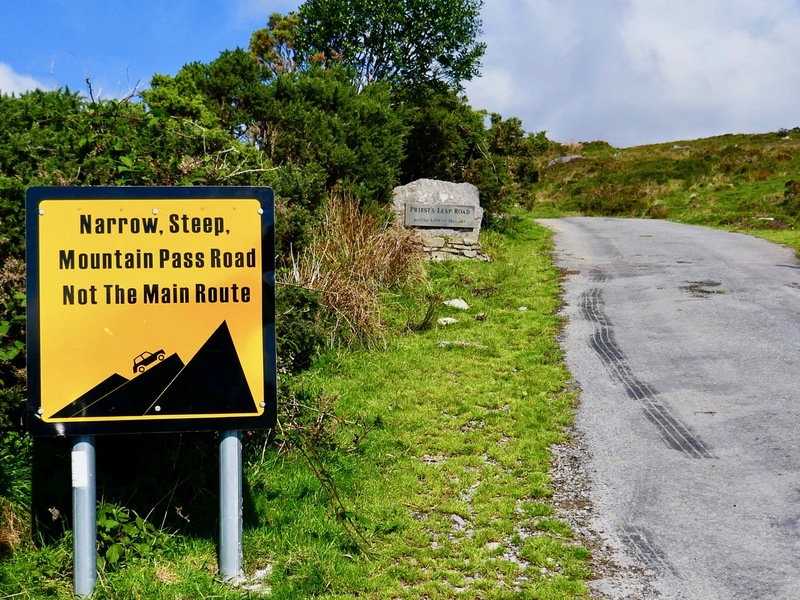 We saw first hand what this could mean on a recent trip to Kerry. 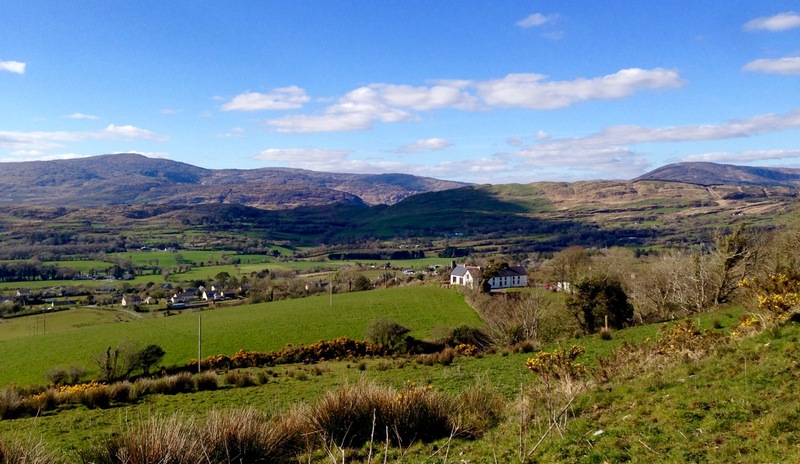 In the mountains above Sneem, on the Iveragh Peninsula, lies the lonely valley of Derrynablaha. It is spectacularly beautiful, but wild and remote. 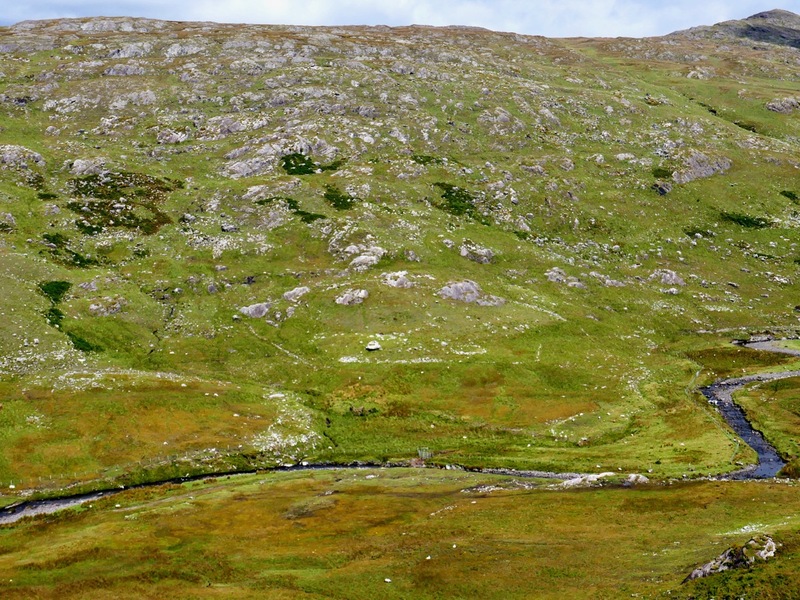 Forty years ago the one house in the valley was occupied by the farmer who ran his sheep on the mountain slope. That house is now in ruins: a new owner until recently simply carried on the use of the land for sheep. 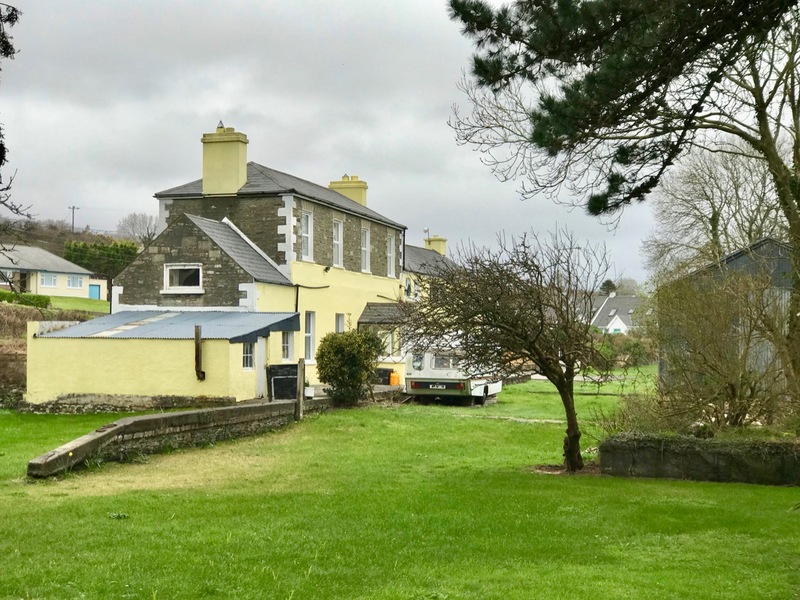 Imagine our surprise and concern, therefore, when, on a recent trip to Derrynablaha, we observed an enormous excavator working in the fields above the house. It had been there for some time. 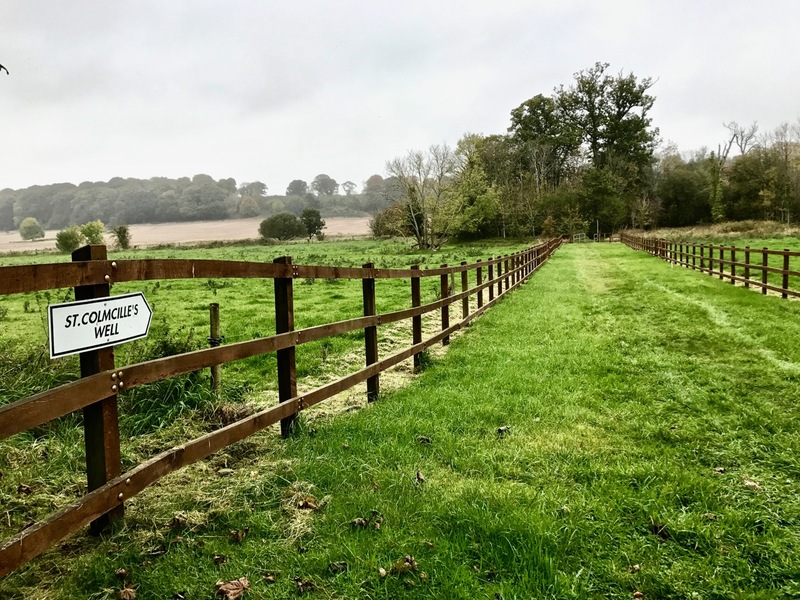 The ground had been levelled, all rocks and old field boundaries had been cleared away, and the land is now ready to be seeded and made into an enormous and pristine green field. So what’s the problem with this? 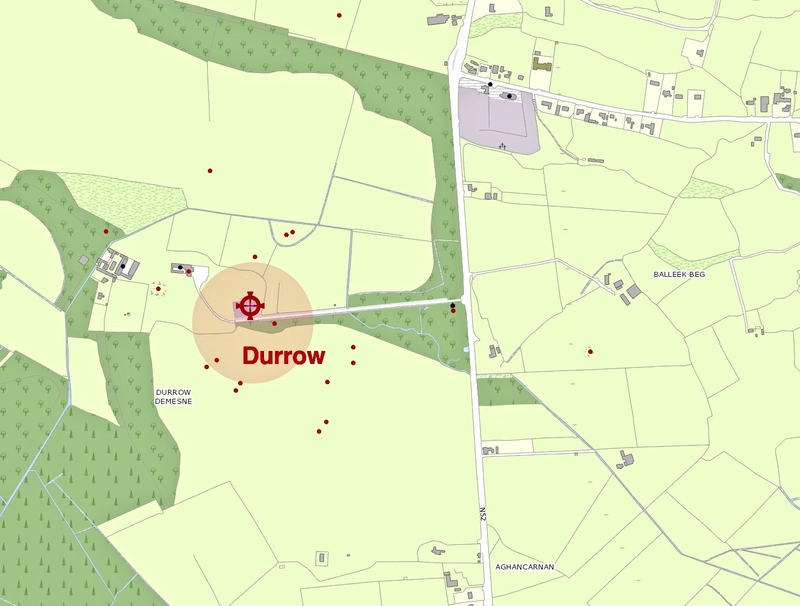 It’s alarming because Derrynablaha, and the neighbouring townland of Derreeny, contain the largest and most significant concentration of rock art in Ireland. 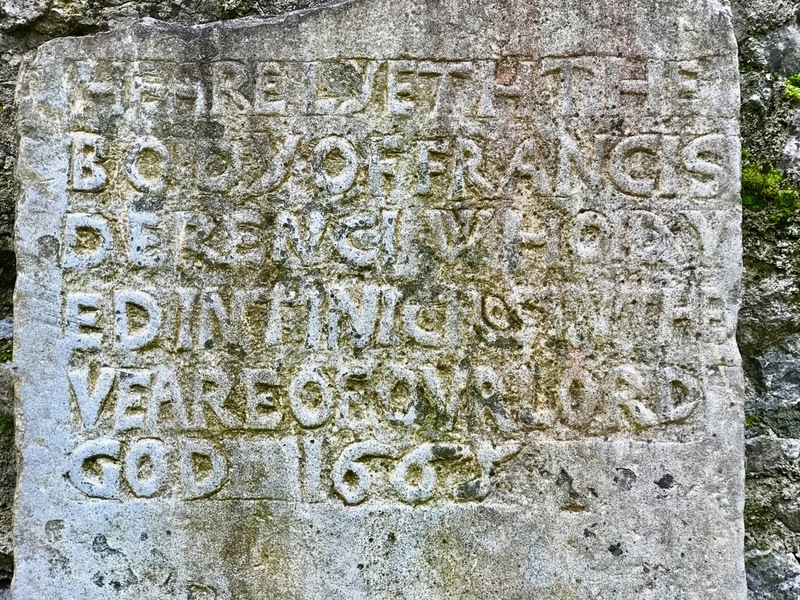 Forty examples have been found and recorded so far. Some of them lie right beside the new field. An assessment by the National Monuments Service took place immediately and they will monitor closely now that they know this is happening. However, damage has already been done. 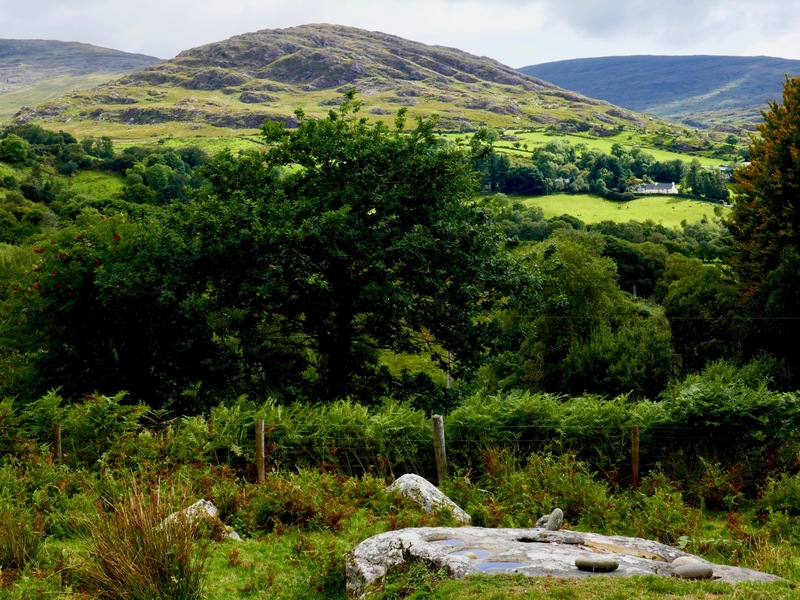 Rock art does not exist in a vacuum – it is part of a prehistoric landscape and nowhere is this more so than in Derrynablaha, where the land has been lightly lived on over the centuries and where prehistoric and historic features lie just beneath the boggy turf. The farmer, of course, is just doing his job. 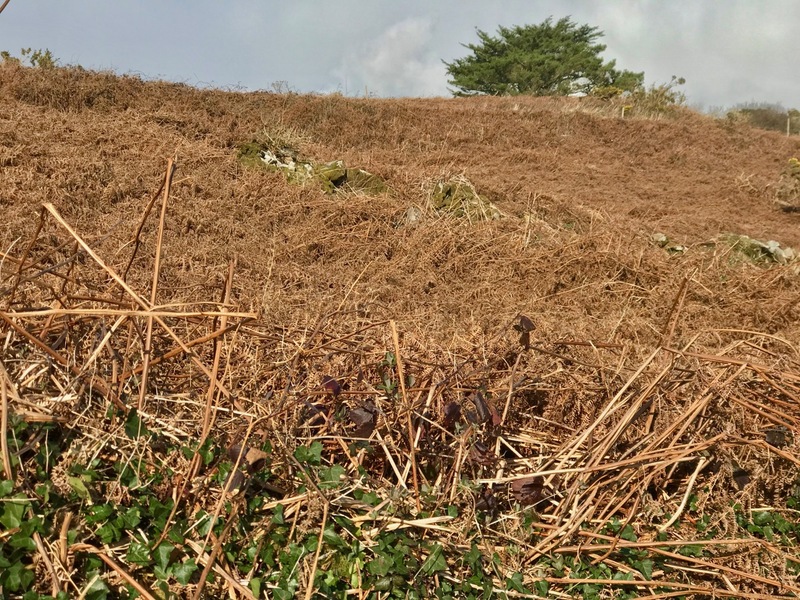 With the encouragement of the grants system he is improving his land, trying to be more competitive and hoping to pass on a viable farm to his son, so the young man won’t have to emigrate like many of his contemporaries. He is aware of the rock art and is avoiding direct contact with any pieces he knows. 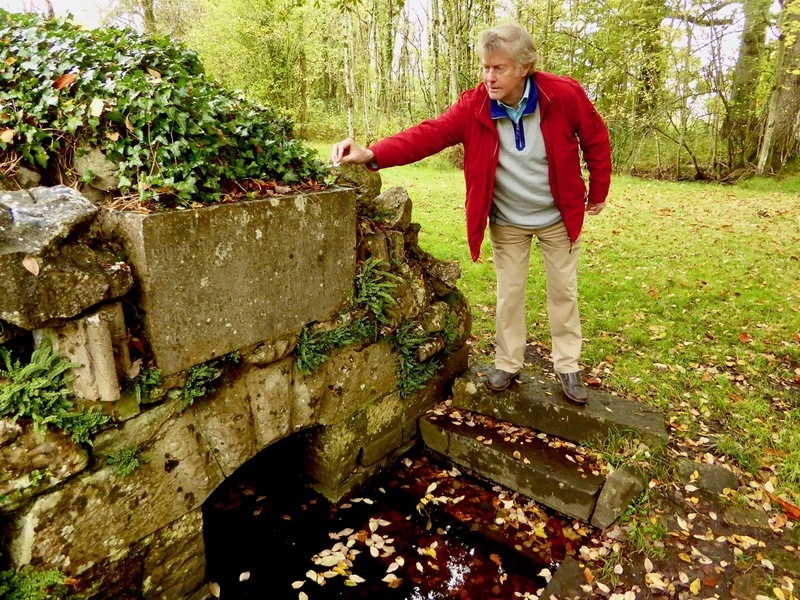 He needs no planning permission (a process that would have involved and alerted the County Archaeologist) to do what he’s doing. In both these scenarios – lack of awareness and the economy – the intentions of everyone concerned were honourable. But honourable intentions won’t save rock art from damage and destruction. Our only hope lies in a Save the Whales approach: the more people who know about and appreciate rock art and who are committed to helping to preserve this precious resource, the better its chances of survival will be.